Another run for the Sox would seem important. 4 shutout innings on 57 pitches for David Price. A playoff appearance sure to be remembered for a long time. Pitch 57 is an elevated 94 mph fastball for a Gonzalez swing/miss. Price is through 4 scoreless innings. 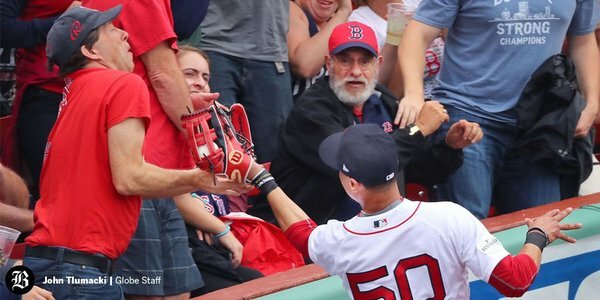 Mookie Betts is having a day in right field. Covering more ground than Lewis and Clark. Betts is positioned as shallow in RF as any player in the big leagues. That allowed him to wipe out a hit there. Now Addison Reed starts throwing. Surprised nobody is warming up behind Price at this point. 47 pitches and previous high in relief was 40. 3 innings, 42 pitches for Pirce -- who has been absolutely carving with outstanding stuff. Price just threw his 41st pitch, his most in one game since returning. Hanley has 4 three-hit playoff games this decade, tied for second-most since 2010, behind only ... Pablo (5). With Price at 32 pitches through 2 innings, no one is up in the Red Sox bullpen. Price has had great command since returning from the DL, all of his pitches, too. Price doesn't blink and Ks Gonzalez, gets Bregman to ground into a 6-4. 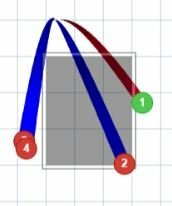 Missed call's only consequence was 3 pitches. McCullers looked at his finger after striking out Moreland. He had blister issues in 2016. McCullers is hobbling around the mound a bit. Ball caught him pretty squarely in the side of the foot. The Red Sox' 77th pitch of the game resulted in the first Astros swing-and-miss of the day as Price Ks Springer. Here is David Price. Sox need to cobble together 6 innings. Price + Reed + Kimbrel? Sandy Leon, who was in the lineup only to catch Fister, is 2 for 2 since Fister left the game. Because, baseball. The Red Sox snapped a streak of 44 consecutive innings without a lead in the postseason. Astros wanted that matchup. They expected the veteran lefty Liriano would carve up the lefty rookie. Kid hammered a bad slider. 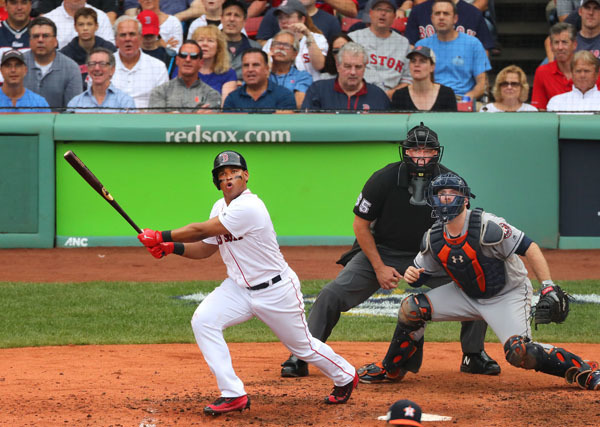 Rafael Devers is the 6th player ever to homer in the postseason before turning 21. 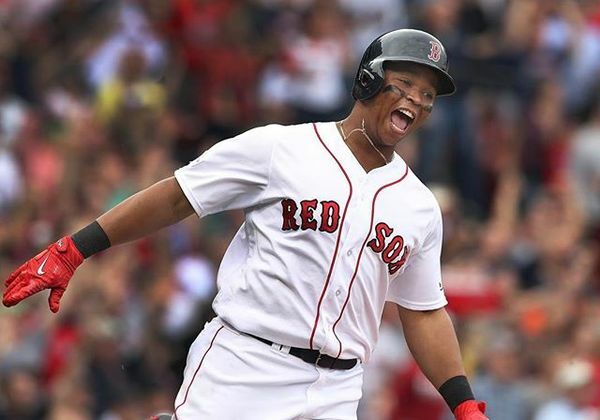 Red Sox take the lead on Rafael Devers' 2-run homer. 4-3 Red Sox, bottom 3rd inning. Peacock is done after 2 2/3. For the first time this series, the Sox are in Houston's bullpen with the game outcome not settled. #RedSox with a pair of two-out doubles by Moreland and Ramirez, 3-2 now. Liriano comes in to face Devers. Price is warming up now as Joe Kelly works in his second inning. That pitch and swing have resulted in hundreds of 2Bs for Pedroia at Fenway. He looks like a guy who can't drive the ball due to bad knee. Sudden Sandy Leon with an RBI single. Bases loaded for Bradley. 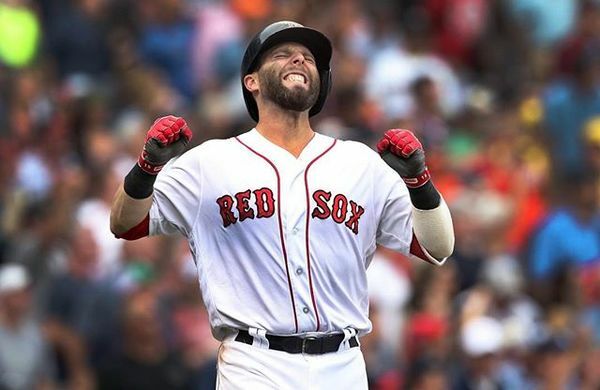 Red Sox have to get that first grand slam at some point, right? Leon went with a 95 mph heater up and away and lined it to left. Fenway has awakened. The most effective Red Sox starter in the last six playoff games was Clay Buchholz. Red Sox have loaded the bases with no outs. 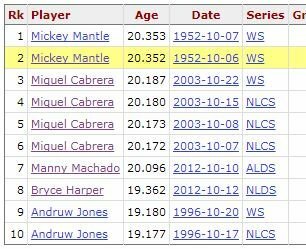 In the regular season, they didn't hit a grand slam for the 1st time since 1953.